Nostalgia can be a dangerous thing. Holding onto something that's outlived its usefulness just because it used to have a purpose? Sometimes you just have to let it go. For most people, that means cleaning out the attic. For toy fans, it means giving away your old 5" figures. For comic companies, it means just letting your characters fade into obscurity. When a storm at sea plummets him deep below the waves, Arthur Curry finds that he can communicate telepathically with the creatures of the sea. Prophecy tells of a great warrior, but only time will tell if Arthur is the true Aquaman. When it comes to repeated reboots of characters, the only DC property that compares to the storied Legion of Superheroes is Aquaman. He's had about a dozen "restarts" since he debuted in 1941, meaning that, on average, none of the versions have lasted more than about 5½ years. Superman, for the record, has had his story restarted once. Maybe twice. Batman got one, the Flash got three... Aquaman gets 12. When you're trying that many different takes on a character, perhaps it's time to admit that the character just lacks the appeal to be a headliner and let him sink to supporting status. Maybe publish a one-shot every few years to keep the trademark active. The current Aquaman is a fairly big change from what immediately preceded him, but is also a lot like the original version. Son of a marine biologist, Arthur was born three months premature and his mother died in childbirth. In order to save his new son, Dr. Phillip Curry exposed the boy to a mutagenic serum to save his life, but with the result that Arthur had to live his entire life in the water - he can't survive outside it for long. When he was swept out to sea, he found that he shared an empathic link with sea creatures and could speak their native languages. 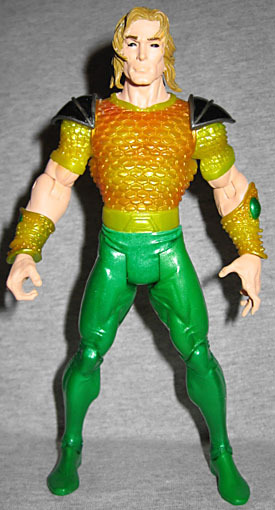 Aquaman's costume is a very nice update of the old green and orange look. So nice, in fact, that it actually manages to not look ridiculous. The pants are solid green, and he has fins coming off his calves. Rather than full-length orange sleeves, the top is short-sleeved, and they're yellow, which gives just a bit of visual contrast. Aquaman doesn't wear any gloves, butdoes have a pair of bracers that look like they're formed from coral. He has the traditional Aquaman belt, and a bit of black armor on his shoulders. The new look was designed by Butch Guice, and is a far sight better than the original. The figure was sculpted by Dave Cortez, who mostly did a good job. The only area that's really a problem is the head. The face is fine - Arthur's looking fairly handsome, and his eyes are solid black, which gives him a creepy, alien look that suits him. The problem is that the head isn't big enough. Not the whole head, just the crown - you know, the top/back bit of your skull. Arthur has shoulder-length blonde hair, which covers a lot, but you can tell by looking that part of his head that should be under there isn't. It's not a major flaw, and you might not even notice it, but it makes him look slightly weird. 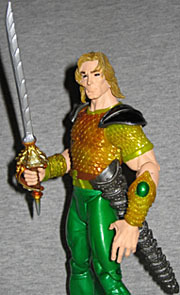 The current Aquaman is subtitled Sword of Atlantis, so you can probably guess what the figure's accessory is. The 5" sword is very ornate, and the paint is lovely. The sword fits in a scabbard that's just as heavy on the detail, and attached to a removable belt. First Appearance Aquaman moves at the ankles, knees, hips, wrists, elbows, shoulders and head. The ankles are nice for swimming poses, but you'd have to have a better range of motion on the neck to truly capture the feel of the life aquatic. Aquaman's comic may not be very interesting, but this is a really good figure. Sure, he may not be the "classic" Arthur Curry, but he'll still be great in your JLA display. Just pretend it's the old guy in a new suit.